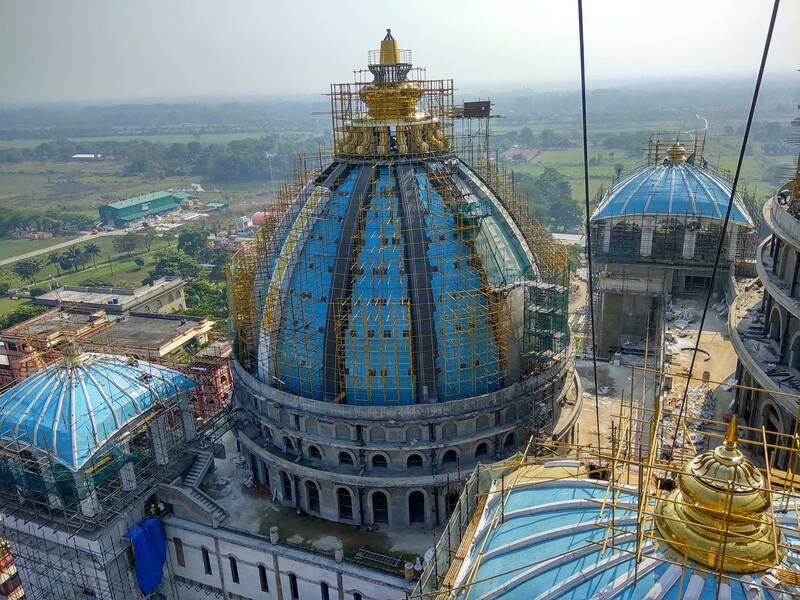 In the photos below you will see work being done on both the Main Dome and Nrsimha Dome Kalashes and Nrsimha Dome Chakra. The Nrsimhadeva Dome Kalash is almost complete and the Main Dome Kalash is fast approaching completion. Between the Kalash mounting, painting and fastening the dome ribs and stars, assembling Lord Nrsimhadeva’s Chakra and working on the Chatris, all the transcendental sevaites are working around the clock to bring the marathon to its completion by February 7th for the Grand Installation Ceremony of the Chakras onto Sri Sri Radha Madhava’s and Lord Nrsimhadeva’s Domes.